Kia says the 2016 Optima will be be available with multiple engine choices while featuring "a more spacious interior, class-up premium features and a number of technologies not previously offered." Kia Motors Corp. plans to unveil the redesigned, fourth-generation Optima midsize sedan at the New York Auto Show in early April. With the redesign, Kia hopes to build on the recent success of the Optima, which now leads the funky Soul hatchback as Kia’s best-selling model in the United States. U.S. sales of the Optima surged after its last redesign for the 2011 model year and have topped 150,000 in each of the past three years, with a record 159,020 units sold in 2014. 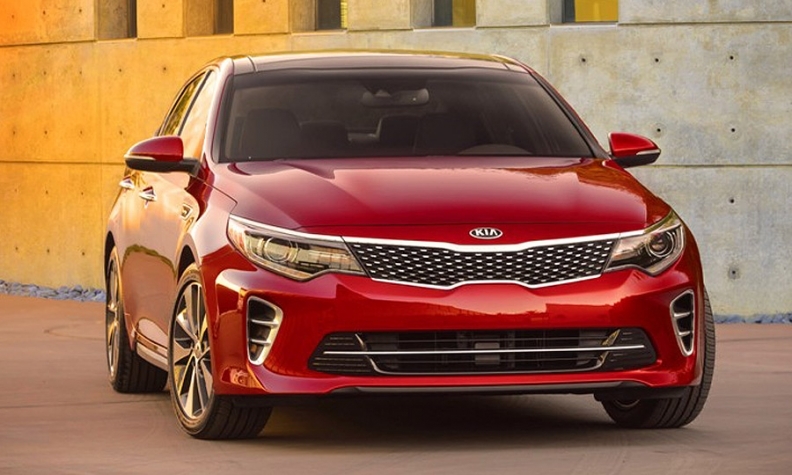 Kia said the Optima will be be available with multiple engine choices while featuring "a more spacious interior, class-up premium features and a number of technologies not previously offered." The redesigned model is slated to go on sale this summer. Renderings and images of the reworked Optima and spy shots taken during testing show the sedan will retain much of its styling, including its fastback silhouette and the “tiger nose” grille that was designed by Hyundai-Kia design boss Peter Schreyer. Kia also unveiled an Optima-based wagon concept called the Sportspace at this month’s Geneva auto show. Designed at Kia’s design studio in Frankfurt, the wagon appears to be ticketed for production to aid Kia in the European market -- though its U.S. prospects are unclear. The redesigned Optima sedan will use a carryover platform and engines from the third-generation model. Kia may offer hybrid and plug-in hybrid variants using the same powertrains as the Optima’s corporate cousin, the Hyundai Sonata.